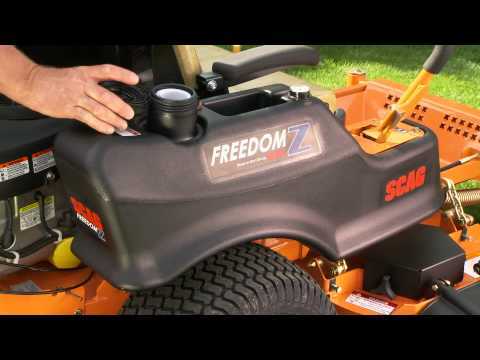 The Freedom Z is designed for commercial and large estate use. We invite you to learn more about the outstanding, commercial grade features of the Freedom Z and how it can save you time while delivering professional results. Up to 8 mph forward and 5 mph reverse speeds deliver maximum productivity. 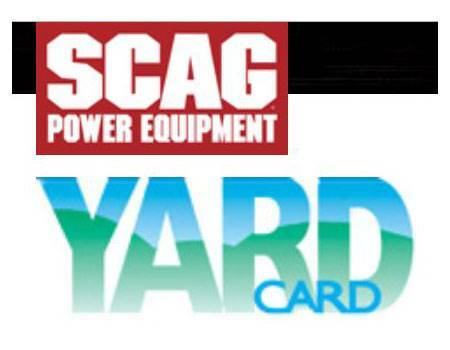 Fast ground speeds will make short work of your residential acreage or commercial property. Fully welded and fabricated, unitized steel, commercial grade main frame design is stronger than "bolt together" or stamped frame designs. This frame is built to last. 48 and 52 in. 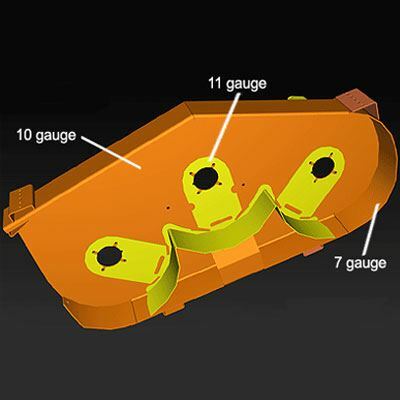 (cutting width) cutter decks are constructed with a 10 ga. top with an 11 ga. reinforcement plate around the spindle mounting area for extra support. The cutter deck skirt is 7 ga. for additional strength. This is not a mass produced, stamped steel deck. This is a commercial grade, fully fabricated and welded heavy steel cutter deck. Power your Freedom with commercial grade, full pressure lubrication engines. 22 hp or 24 hp Kohler 7000 PRO Series V-Twin engine options. 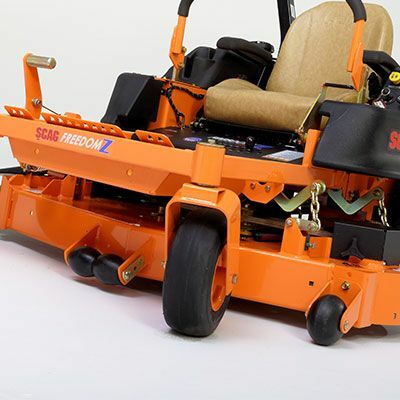 Low-maintenance mower design has few grease points, saving you maintenance time and giving you the freedom to do other things. 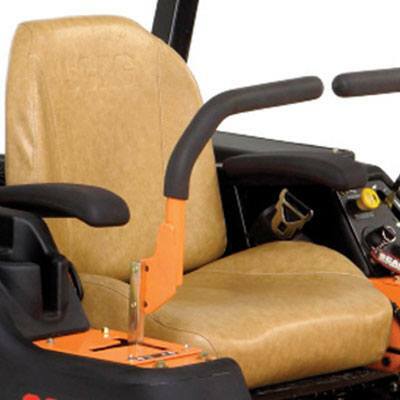 Fixed-position ROPS (Roll Over Protection System) is standard equipment along with retractable seatbelts. ROPS provides additional operator safety. 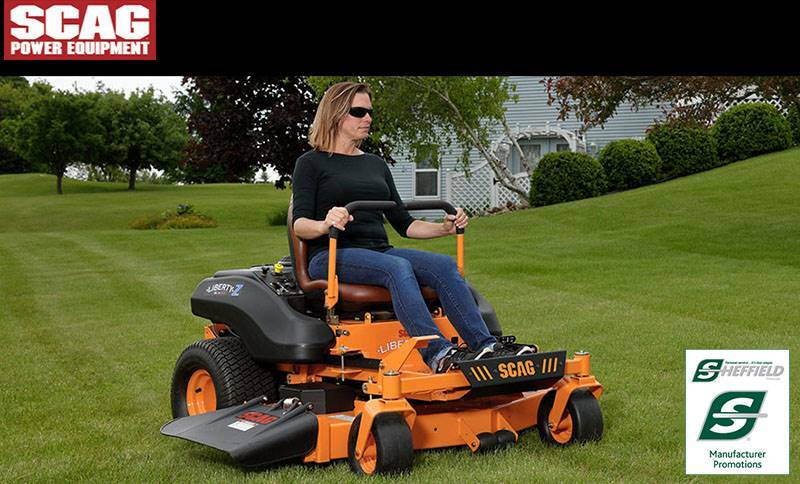 Compact mower size enables you to take the Freedom Z into tight places. The Freedom Z also occupies less space in your garage or on the trailer, leaving more room for other tools and toys. Extra large foot plate for improved operator comfort and easier mounting and dismounting of the mower. The pierced, extruded metal tread ensures solid footing. Foot pedal deck lift features a large knurled peg for "no slip" deck lifting. Spring-assisted design makes lifting the cutter deck easy and smooth. 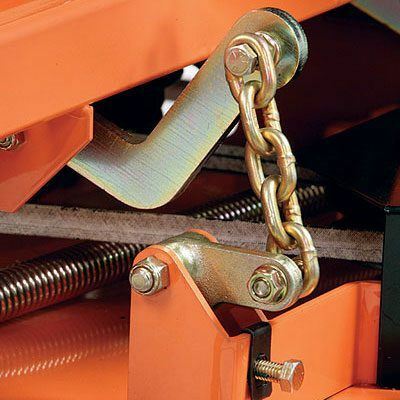 Spring-loaded, self-adjusting idler arms effortlessly keep all belts in constant adjustment for maximum life and no maintenance. All steel pulleys are stronger than plastic pulley designs. 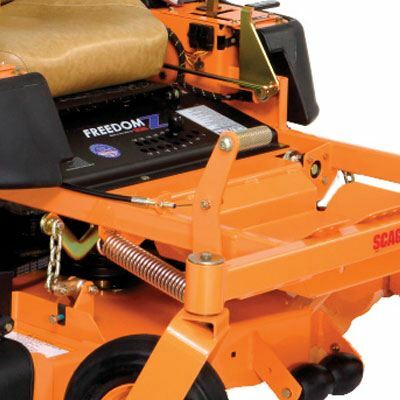 This is a Scag....you will not find plastic pulleys on the Freedom Z. Steel dust and debris covers are fitted over idler pulley bearings and spindles to keep foreign material out, extending bearing life. Comfortable, adjustable (with tool), fully cushioned seat with padded armrests. Retractable seatbelts are standard equipment. Padded steering control levers with ultra-smooth dampers for smooth, precise responsiveness. Levers are adjustable. 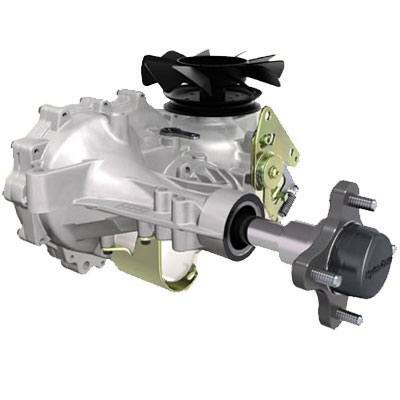 Steering dampers are designed and positioned for smooth steering lever operation and minimal control effort. 4-corner cutter deck adjustment mechanisms allow for easy deck leveling and pitch adjustment to deliver a smooth, even cut. 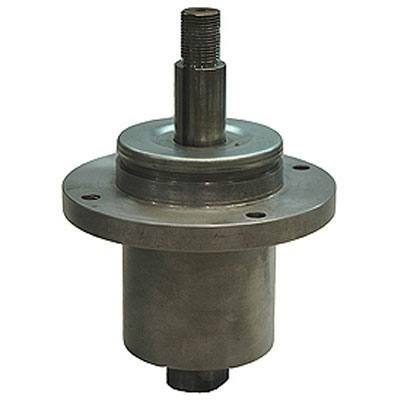 Heavy-duty, no maintenance blade drive spindles provide reliable performance day in and day out; aluminum housings and sealed ball bearings. Interlocked parking brake system prevents movement when parked on inclines. The mower cannot be driven when the brake is applied. This prevents premature brake wear. Operator friendly instrument panel is conveniently located just to the left of the operator. It includes an ignition switch, mower engagement switch, and separate choke and throttle controls. 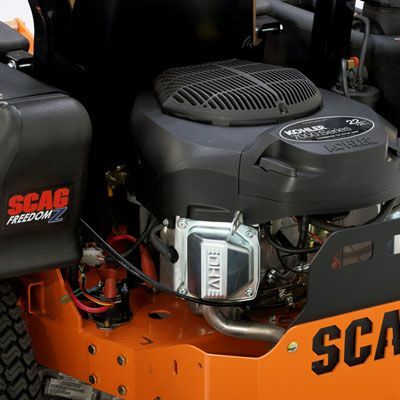 User-friendly mower design allows quick access to the engine and filters, for easy maintenance. Cup holder and storage bin are molded into the fuel tank to provide added operator convenience and comfort. Hydraulic oil reservoir and maintenance-free battery are enclosed within the left side tank molding to prevent external damage and to provide a sleek, clean appearance. Engine oil drain makes oil changes easy. 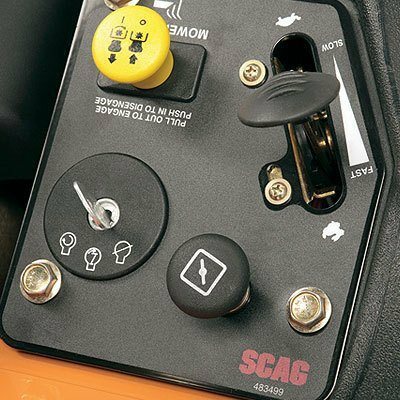 High-quality electrical components such as switches and tightly woven, custom wiring harness looms are used throughout the Scag mower line for dependability and long life. Digital hour meter only activates when engine is running and is located within easy sight of the operator while in the operating position. Productive, time saving accessories like a grass collection system and high-powered halogen lights are available for the Freedom Z.
Chute down - 60.5 in. Chute in transport position - 49 in.